Accelerated Reader is available for all second, third, fourth, and fifth grade students at Forest Hill. Test can only be taken by students at school; however, reading at home is the best way to help your child be successful in this program. The button at the top of this page will take you to a website that will give you information on which books have test, the reading level of a book, and how many points the book is worth.. Check with your child's teacher about the requirements for each nine-weeks. You can check your child's progress with AR by logging in to Home Connect. 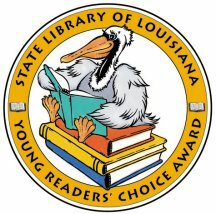 Louisiana Young Readers' Choice Award is a reading program sponsored by the State Library of Louisiana. Each 3, 4, and 5 grade student is encouraged to read books from the list. Those who participate by reading three or more books and passing the AR test will be invited to a voting party in January. Feel free to contact Mrs. Durham with any questions!